I wrote to you a couple of years ago about our four common goldfish in the 55 gallon tank, and your answer was so helpful, and now I have another question for you along the same lines. Some background: in Fall 2014 we pulled our four common goldfish out of our outdoor pond for the winter, and stored them in our 55 gallon tank indoors until the pond outside came up to a livable temperature again in the spring. Summer 2015 the fish reproduced outside in the pond (big shocker to us), so in the Fall of 2015, when we pulled the big fish out of the pond, eight babies came out too! Over the winter 2015-16 we had four adult goldfish and eight baby goldfish in the tank (adults all around 5"-6" and babies all around 0.75"-2"). Knowing that the 55 gallon tank was overstocked, I monitored the tank levels carefully and performed frequent water changes throughout the winter. Spring 2016, four adults and four babies went back outside into the pond, and I decided to keep four babies inside in the 55 gallon for the summer. overstocked (and I'm sure there was a serious shock to the bio load on my filter), so I performed a 50% water change this morning, and plan to do regular ~30% water changes daily until we either repair the pond or get a bigger tank. 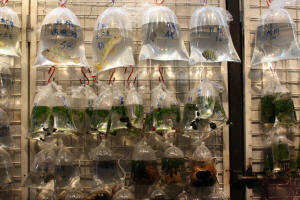 In the meantime, do you think that it is safe to keep that many goldfish in a 55 gallon tank? I currently have one filter (rated for 70 gallons) running in the tank. I'm assuming a second filter would be advisable. Is doing a partial water change every day helping or hurting my cycled tank? It appears a baby from Summer 2015 was left in the pond over the winter and survived, so I pulled him out after I realized he was in there. While I was trying to scoop out the extra fish, *another* baby from this year got caught in my net! He appears to be roughly a month(?) old (he's ~1" long). He's definitely small enough that our biggest fish wouldn't have a problem eating him, and all of the fish nip at his fins when they see him, though he's great at hiding among the driftwood in the tank, so they don't spot him too often. My question is, do you think it's ok to leave the tiny baby in the tank with ten other larger goldfish and take the chance that he's a great survivor, or should I put him in my spare 10 gallon tank for the time being, until he grows a little bigger? could still see each other for the social aspect. Thank you again. I really appreciate you taking the time to write back to me! I came across your website years ago when searching for information on goldfish diseases. I loved the way you shared such valuable information and included a great page of individual questions you receive from owners having problems with your answers to each one. So helpful to me when I was first starting out as a stressed-out, first-time fish mom! <Not small; young. There's a difference. Get yourself a side plate out of the cupboard, the sort you eat toast from. Hold it up. That's about the size of an adult fancy Goldfish. Grab a second. That's your two goldfish within a couple years if you look after them properly. As should be immediately obvious, 5 gallons isn't anywhere near big enough for them. one is a lion-head named Mufasa and the other (Nova) I got today and for the life of me I cannot remember the type but he has HUGE eyes and is orange and white its also from the goldfish family...either way my question is can goldfish become jealous that they have a new friend in the tank? because Mufasa(the Lion-head) will take runs at Nova and nip his fins...that being said Nova gives it back in small portions... Nova seem timid in the tank but Mufasa (the lion head) swims freely and without worry, is the lion-head bullying my other new goldfish? Thanks and cant wait to hear from you! Hi again, great to hear back from you and yes I did read on and saw that 20gallons was about the size needed luckily I have one were just getting it set up over time while the goldfish are still young for when they are larger! One last question before I let you go how can I tell if Mufasa and nova are male or female? I have a 30 gallon tank with a 75 gallon filter. There are 2 Oranda goldfish in this tank already. Do you think I could add a third Oranda to the tank? I'm only very new at this, and I'm finding it very frustrating the information I've been given <by> my the various local pet shops, which just confuses me more. I have a 120L tank with cold water fish in it, fantails ,comets, a black more a peppered catfish and comets. Every time I talk to the local pet shop they give me different answers and I am left wondering what to believe. 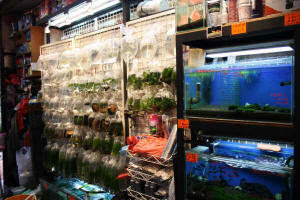 I even had one of them sell me a paradise fish to put in with the above in my cold water tank! Needless to say it attacked one of my "boggle" eyed fish and I had it back on their counter within the hour! My main concern is I'm not sure how many fish I should have in the tank. I would like them to grow big as at the moment they are only between 1cm- 3cms. Also I've noticed some of them are losing their scales, they seem rather happy other than that? <See our goldfish section for more. Thank-you from the sounds of that my tank is WAY too full, I have like 12 in there! I simply have a question that I hope you can answer. It's difficult finding a quality Oranda goldfish breeder here in southern California, so my best bet was to ask you guys if you know of any Oranda goldfish breeders that you would recommend? Does not necessarily have to be in southern California, as long as they ship. Thanks! I have a fairly new, 26 gal. system (5 weeks)and a large Chocolate Oranda about 2x4 in., I had a smaller one and lost him, I think due to diet from all I have read as I was only feeding flake food, by the time I knew about feeding peas and such it was too late for him. I started feeding my remaining Oranda one pea a day and pellet or flake food for the second feeding. give him this on a reg. basis? <You can leave plant food in the tank as long as you want. It won't harm water quality. By all means pipette out (turkey basters are ideal) any bits that are messing up the tank visually, but otherwise, don't worry about it. I guess My main question would be what would you consider a well balance diet for a large choc. Oranda? I want to get him a friend when the local shop get some more. I didn't realize they would be so hard to come by. He is a beautiful orange and black named "smooch" as he will eat from my fingers! <Make sure you read first, and are prepared to buy a big aquarium; at least 125 l/30 gallons, and ideally more, and with a serious filter to boot, not some poky hang-on-the-back unit. but I didn't know which type of goldfish that I should get. I was wondering what type of goldfish would live long and fits a beginner like me. I was actually thinking of choosing an orange Oranda, but when I searched it online, I saw really big Orandas with large things on their heads. The one I saw at the pet shop (and the one that I was hoping to buy) was way smaller and cuter, and the lump on the head was smaller. Does that mean that the ones that i saw were babies? Or were they a different kind of Orandas? Also, what kind of tank size would 2-3 Orandas need? Thank you for reviewing this e-mail and I hope to hear from you again soon. maintain. We get dozens of messages each week from people who have made this common mistake, and it's very depressing for me to read them all! Bite the bullet, get a 20 gallon tank (which takes up little more space than a 10 gallon system, and doesn't cost much more either) and start keeping fish the sensible way. If you're thinking about an aquarium smaller than even 10 gallons, then think about getting a vase, filling it with water, and sticking in some cut flowers. Seriously. This will be better for everyone!